According to a recent Morgan Stanley report, linked HERE, the Millennials and Gen Z are about to provide a positive "youth jolt" to power the US economy higher, and "provide a rosier outlook for Social Security and Medicare". 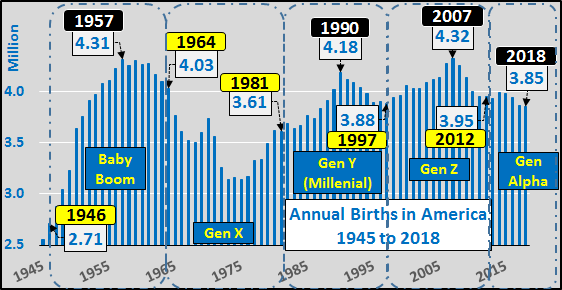 "For the U.S. economy, the demographic tailwinds created by these high-population cohorts could be significant, delivering the kind of “youth jolt” that the Baby Boomers were famous for. However, according to a recent report from Morgan Stanley Research, the implications of these demographic shifts aren’t baked into current Congressional Budget Office forecasts, in particular, the projections for labor-force growth". 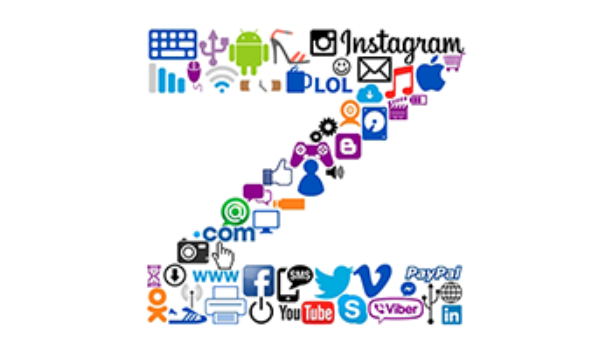 "Work by the firm’s economic team, along with an in-depth survey of Generation Y and Z consumers, uncovered a significantly brighter outlook for the U.S. in the coming decades than previously thought. 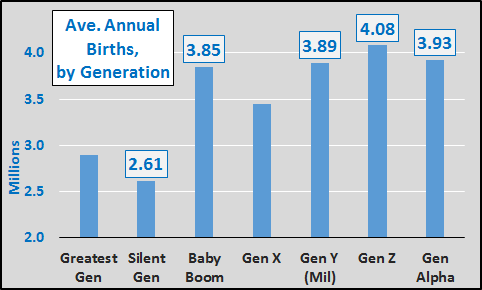 As Gens Y and Z combine in the workforce, these two outsized generations could power higher consumption, wages and housing demand, all pillars of GDP growth". 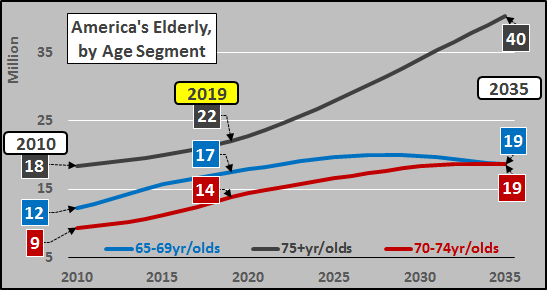 "In addition, these new projections on labor-force growth could also mean a rosier outlook for Social Security and Medicare solvency, offering investors an overall bullish view for the U.S. between the 2020s and 2040s—and policymakers a different perspective on the road ahead." Before reading my rebuttal, I really encourage readers to read through Morgan Stanley's Research. 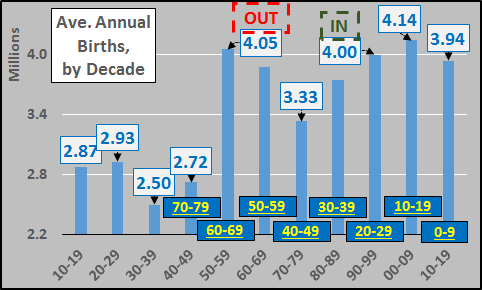 Average annual births by decade seems a whole lot simpler (charted below). 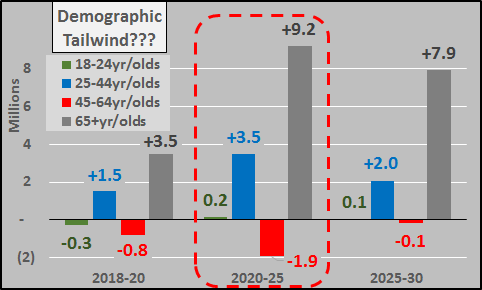 Far simpler to gauge the incoming population (those aged 20-29 born from 1990 to 1999) versus the outgoing population (those aged 60-69 born from 1950 to 1959). As the dashed boxes below highlight, on a decade by decade comp basis, the incoming '90-'99 period represents fewer persons than did the outgoing '50-'59 period. 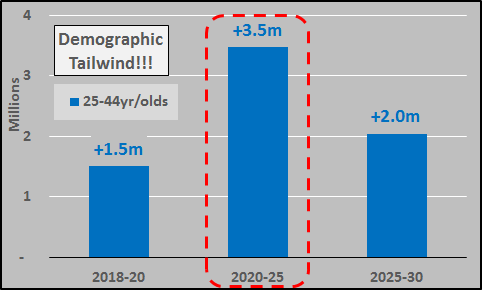 The days of easy population driven comps and rising population driven demand are behind us (aka, the demographic tailwind has ended). The chart below is a simple picture of the change per five year periods of potential buyers (25 to 64 year olds) versus potential sellers (65+ year olds). 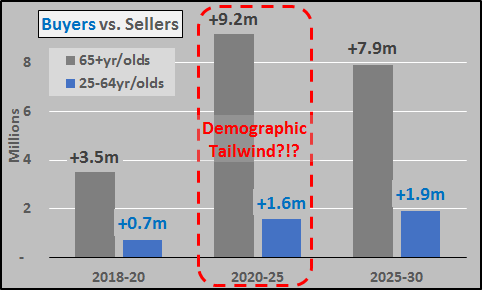 From 2020 to 2025, will see more than a 5 to 1 ratio of growth among the potential sellers versus potential buyers...a complete reversal of the 1 to 5 ratio of potential sellers to potential buyers of the previous 50 years. The chart below highlights the average earning, spending, and labor force participation differentials of the demographic segments. 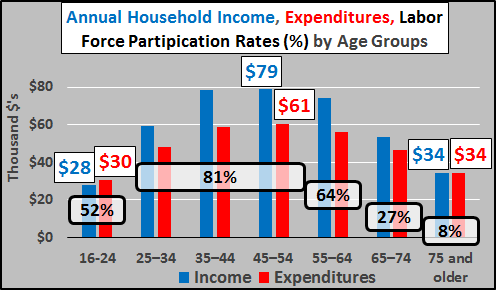 On average, 75+ year olds earn and spend half of what the peak age groups do...and have just an 8% labor force participation rate compared to the 80% of the peak age groups. 70% of college graduates, over 44 million Americans, hold significant student loan debt. In total, over $1.5 trillion is owed and the average graduate has $37 thousand in debt. Thanks to a recent report by Federal Reserve Bank of St. Louis (HERE), "in terms of wealth accumulation, college is not paying off for recent college graduates on average--at least, not yet". In particular, "Disturbingly, the wealth benefits of college and post-graduate degrees was much lower among non-white family heads...born in and after the 1980's". This seems to imply and agree with my recent article (HERE) that wealth creation of the last decade via ZIRP, QE, etc. is a matter of asset inflation for the have's (primarily white) rather than a meritocracy for the have-nots. Thus the surging $166+ billion in record 90 day+ student loan delinquencies detail that recent graduate income levels are not high enough for debt repayment, let alone house hunting. Add to this marriages continuing to be delayed (median males now waiting to 30, females until 28) and record low total fertility rates (1.72 in 2018, down from 2.12 in 2007)...and annual household creation continues to undershoot expectations. Given mortgage rates still have little room to move lower, the mismatch of elderly potential sellers versus younger potential buyers, and the student loan hindered young adults choosing to delay marriage and have significantly fewer children...I'm of a mind housing (anywhere near current prices) is oversupplied and a variant of 2008's housing crisis is more likely than not. The US economy is not about to be positively "jolted". But then again, I'm just a blogger with no research team, nothing to sell, and no book to talk. This is America, so when in doubt, just pick the source with the happy story that suits you best.